I've spent most of this weekend watching the FIFA Wold Cup games. As you probably know by now I'm a big soccer fan so I'm not sleeping on the games. Watching soccer games is as sporty as I get, lol! Since I've been passionate about this sport for quite long time (since I was 5), I often surprise people with my soccer knowledge. 1. 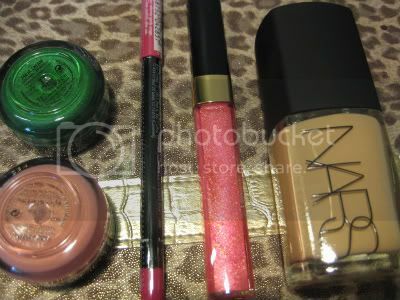 I stopped at the Nars counter at the Bay to get a new bottle of sheer glow foundation. I have gotten tanner during my trip and shade Fiji is now too light. Though the one I got is only one shade darker (Punjab), it matches my summer tan quite nicely. 2. I then went over to the Chanel counter and picked up Venus Glossier which I had wanted for the longest time. This one should look gorgeous over all my pinky coral lipsticks such as Genial RA, Teheran RC, Nars Niagara and MAC Vegas Volt. #5 - is a peachy coral, I think this one is multi purpose and can be worn on cheeks, lips and eyes. #22 - is an emerald green shade. I wear green shades quite a lot and do not currently have a green base. I use Greenstroke p/p but that's a much lighter silvery green. I cannot wait to use this one! 4. I also grabbed a MUFE lip liner in 16C which is a bright fuchsia shade. I have heard great things about MUFE lip liners especially on their staying power so I thought I give them a try. I already have a couple of fuchsia shade liners but I wear bright pinks a lot so I thought this was the right shade to start off with. Bought anything recently? Please share in comments. Also let me know if you have any of these products and how you like them. 3 Responses to "June Haul - Been Breakin' My No-Buy!" Naughty naughty! LOL! I'm on a no-buy too but that's because I am very interested in the MAC July Collections (can't break now). I hope you enjoy those Aqua Creams. And you know I'm all about my NARS Sheer Glow. I love football (soccer) too! I went to watch the England game on Saturday and was the only girl there amongst my friends. Tina - I can never go on no-buy, lol! I always break it. Sheer Glow is awesome! I just couldn't use my winter one anymore, got too tanned. Rebecca - thanks :) Soccer is the best! I'm getting my hubby to watch it.